What explains the hitherto mysterious correlation between zinc (Zn) and silicon, an element not involved in the Zn cycle? The strong Zn-SiO44- correlation is caused by a combination of surface uptake, desorption from particles, and hydrothermal input, and is therefore completely fortuitous. 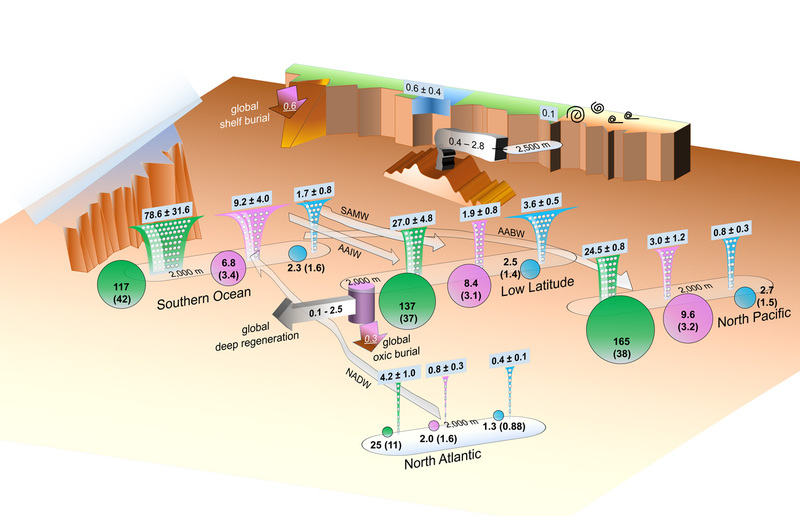 Figure: This schematic shows the reconstructed internal particle-associated cycling of zinc (Zn) in the ocean, as well as some recent estimates of the external sources and sinks of Zn. Funnels represent fluxes of particulate zinc (pink; in giga mol/yr), silicon (green; in tera mol/yr) and phosphorous (cyan; in tera mol/yr), which are biologically-produced in the sunlit surface ocean and exported to the subsurface. In the subsurface, the fluxes gradually attenuate due to degradation/dissolution. Particulate zinc flux attenuates quickly like particulate phosphorus, meaning that these two compounds are associated with labile soft tissues of plankton and re-enter water column at shallower depths than silicon, which is a hard-tissue compound. However, a significant amount of dissolved zinc is supplied to the deep ocean (below 2,000 m; 0.1-2.5 giga mol/yr), which is most likely resulted from a combination of seafloor hydrothermal input and desorption of the zinc ions that are passively adsorbed on the particles at shallower depths. Circles represent the mean dissolved concentrations of the above three compounds at depths below 2,000 m of different regions, which indicate that the mentioned excess input of zinc makes its deep ocean increasing trend (according to water flow arrows) more similar to silicon than phosphorous, and eventually leads to a coincidental zinc-silicon correlation in the ocean. Also annotated are some estimates of the zinc input from rivers and dust, and those of removal to deep and shelf sediments. Click here to view the figure larger.